pure coat Grano Sealer is a clear solvent based sealer with a semi-wet look finish much like the pure coat Semi-Gloss. 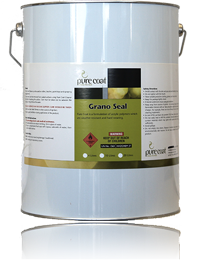 The ease of application makes pure coat Grano Seal perfect for a DIY project. Perfect for creating a water resistant barrier, protecting your surfaces for a hard-wearing beautiful appearance. Enhances and protects the appearance of pavers as well as masking efflorescence bloom and preventing dusting. Resists water and dust (airborne) damage. all surfaces and affected areas must be clean from dust, loose material and mortar spills. Broom-in a chemical mix (generally acid etching) to affected areas, particularly stained, dirty or moss covered surfaces. High pressure clean all affected areas. Repeat chemical mix on affected areas that are still marked if needed. Make sure to pressure clean it off immediately. Before applying pure coat Sealer, the affected areas must be completely dry. Stir tin thoroughly before use. apply two (2) coats of pure coat Sealer by roller or airless spray gun. Second coat to be applied as soon as first coat is dry. Depending on weather conditions, pure coat Sealer will dry underfoot within 1-3 hours. Heavy traffic areas (eg. Driveway/Carport) require up to three days drying time. Clean brushes,rollers and airless spray guns with water before they dry. A coverage rate of approximately 8m² per litre on a smooth surface, however the porosity and texture of the surface and method of application may vary the coverage rate. Ensure good ventilation during application of the product.